For thirty years, Purple Crane has provided affordable, high quality, full-service crane rentals throughout Southern California for a wide variety of projects, including lifting and transporting shipping containers. Our fleet of heavy-duty trucks and trailers allow us to transport shipping containers and other items between locations, anywhere in Southern California, and we can arrange crane service at both ends. Our crane operators are licensed and insured, with between 9 and 40 years of experience. Their expertise has been certified by the NCCCO (National Commission for the Certification of Crane Operators). We have the ability to lift almost any shipping container, small or large, light- or heavy-duty: our state of the art cranes range from 3-ton to 75-ton capacity, and reach as high as 165 feet. We are OSHA compliant and fully insured, and we can provide same-day certificates of insurance when needed. 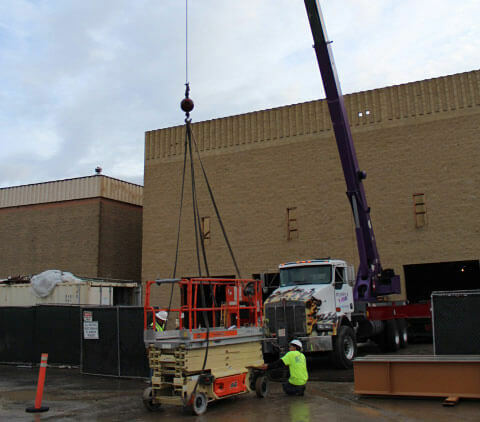 In addition, our knowledgeable staff will determine exactly what equipment you need for your project, so you'll get the right cranes, trucks, and other equipment the first time, every time. We're committed to providing accurate, efficient service that helps keep your project under budget and on track. Call Purple Crane today: we are available 24/7 to take your call and provide our services. You'll always reach a live person who can answer any questions and provide you with a competitive price for lifting and/or transferring your shipping container.